In this lesson, we will learn how to apply exponential growth in real-life situations. The population of a city increases by 4 % every year. How many years does it take for the population of the city to double? A bacterial colony’s population doubles every 5 hours. How long does it take to triple? Give the result to the nearest one decimal place. A mathematical model predicts that the population of a city, 𝑥 million, will be given by the formula 𝑥 = 2 ( 1 . 2 2 ) 𝑛 , where 𝑛 is the number of years from now. 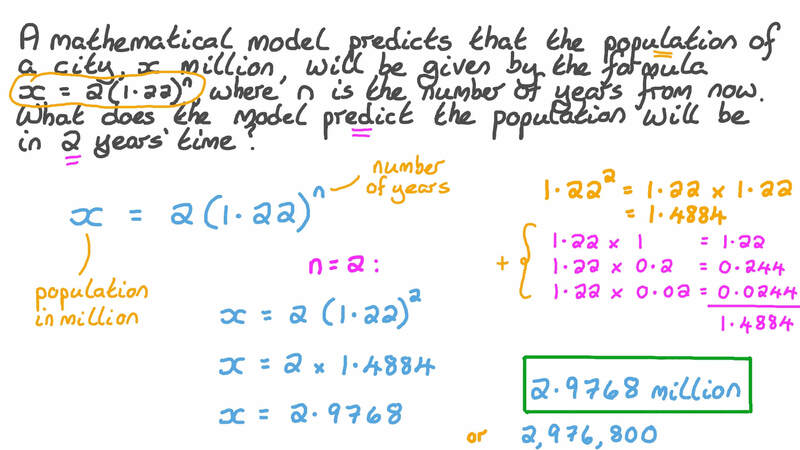 What does the model predict the population will be in 2 years’ time? At the end of 2000, the population of a country was 22.4 million. Since then, the population has increased by 5 . 6 % every year. What is the population, rounded to the nearest tenth, of the country at the end of 2037? 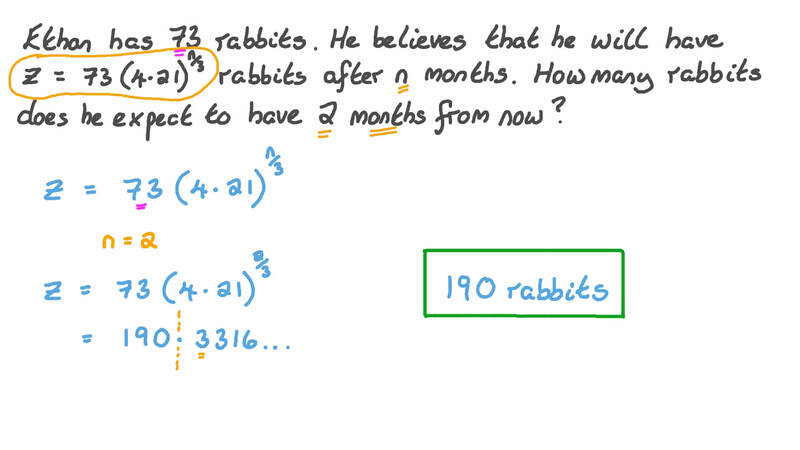 Karim has 73 rabbits. He believes that he will have 𝑧 = 7 3 ( 4 . 2 3 ) 𝑛 3 rabbits after 𝑛 months. How many rabbits does he expect to have 2 months from now? A microorganism reproduces by binary fission, where every hour each cell divides into two cells. Given that there are 24 431 cells to begin with, determine how long it will take for there to be 97 724 cells. A wooden artifact from an archeological dig contains 60 percent of the carbon-14 that is present in living trees. To the nearest year, how long ago was the wood for the artifact cut from the tree? Note that the half-life of carbon-14 is 5 7 3 0 years. The population of Malawi, in millions, between 1960 and 2016 can be modeled by the function 𝑃 ( 𝑡 ) = 3 . 6 2  1 . 0 2 9  𝑡 . By how much has the average rate of growth changed from the period 1960 to 1965 to the period 2011 to 2016? Give your answer in thousands per year to the nearest thousand. In 1970, the world population was 3.682 billion and showed a growth rate of 2 . 0 8 % per year. Assuming a constant growth rate, what would have been the estimate for the size of the population in 2017? Give your answer accurate to four significant figures. The population of a city is growing according to the equation 𝑥 = 9 ( 1 . 7 9 ) 𝑛 , where 𝑥 is the population in millions, and 𝑛 is the number of years since 2015. What was the population of the city in 2015? A cattle farm has 25 cows. The farmer predicts that each year he will have 1 9 % more cows than the year before. How many cows, to the nearest whole number, will he have after 7 years? An area covered in green algae was found on July 5 on the bottom of a swimming pool. The area, in square millimeters, the algae covers 𝑡 days later is given by 𝐴 = 1 . 2 ⋅ 2 𝑡 3 . AIt is the area in square millimeters covered by the algae on July 5. BIt is the number of days needed for the algae to cover the bottom of the swimming pool. CIt is the time taken by the algae to cover that area on July 5. DIt is the area in square millimeters of the swimming pool. EIt is the time to reach the bottom of the swimming pool. What does 2 𝑡 3 mean? AThe area covered by the algae doubles every three days. BThe area covered by the algae doubles every third of a day. CThe area covered by the algae triples every two days. DThe area covered by the algae triples every day. EThe area covered by the algae doubles every day.